Thompson Photo Products is a fourth-generation family-owned business, founded in Knoxville, Tennessee in 1902. The company evolved from a commercial photography enterprise to a retail business in the 1930's. The first retail store operated as the Snap Shop in downtown Knoxville. Today we have two retail stores in Knoxville. Our main location is pictured below. 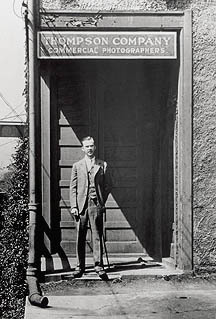 SECOND GENERATION - Charles "Bert" Thompson's self-portait outside his Knoxville studio, circa 1930. He is the grandfather of Margaret Anne Thompson, current president of Thompon Photo Products.